Image: Marvel Comics. Secret Wars #8 art by Esad Ribic and Ive Svorcina. Black Panther isn’t just one of the Marvel universe’s smartest and most powerful heroes, he’s often the one with the most tricks up his sleeve. If Batman is DC Comics’ king of out-of-nowhere moments of surprise, T’Challa handily takes the crown for Marvel. Here’s a few times he grandly let us know he’s always a few steps ahead of Marvel’s mightiest. Black Panther is a man who’s all about plans, and he’s literally been doing it since his first appearance, all the way back in 1966's Fantastic Four #52. T’Challa invites the Fantastic Four to his isolated nation by gifting them a fancy hovercraft, only to use the opportunity to test their skills as a fighting unit. It does... not go well for the FF gang. Donning his Black Panther garb, T’Challa systematically hunts down each member of the team, strategizing how to best isolate them all and counteract their superpowers. He does it easily, too, and only relents—to bluntly inform them it was merely a test of their skills and little more than an experiment to him—when they get a chance to gang up on him. But it was a hell of an entrance to make, nonetheless. By the time the ‘60s were over, T’Challa’s adventures were branching out beyond the borders of Wakanda. He was a card-carrying Avenger and started regularly operating in the US alongside the rest of Earth’s mightiest heroes. But T’Challa also found himself and his fellow Avengers caught up in bubbling racial tension in the country, stoked by hateful debates on a popular talk show... and the fact that there had been sightings of the Black Panther running around committing petty crimes, too. It turns out the whole thing was a plan stoked by the Sons of the Serpents to try and kick off a new civil war, with the unmasking of their “criminal” Black Panther imposter as a black, anti-white activist on national television as a catalyst. T’Challa himself spends most of the story on the run from the allegations against him, and is ultimately captured by the Serpents—but he saves the day in the climax by smashing his way onto TV to unmask the Serpent’s faux-Panther, who it turns out was actually a white guy wearing an elaborate mask. 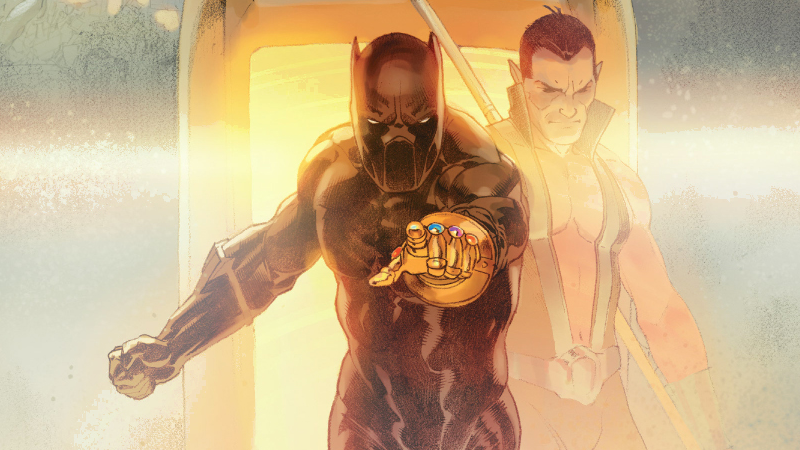 In the process, he reveals his own identity to the watching world, but T’Challa doesn’t care in the slightest. Okay, this doesn’t technically happen to “our” Tony Stark—it happens to a sinister time paradox version of him during the twisty-turny, time travel shenanigans of the “Enemy of the State II” storyline in Christopher Priest and Sal Velluto’s Black Panther back in 2002. But our Tony watches T’Challa go up against the time-twisted version of himself, clad in special armor to counteract Black Panther’s vibranium-enhanced suit, and is absolutely horrified to see what T’Challa is more than willing to do to fight him, if the need ever arises (which, given that superheroes love to fight each other all the time, is a logical potential future). It’s not just that T’Challa beats the time paradox Iron Man, though, it’s the way he does it. He overwhelms the functions of Iron Man’s suit, not just disabling it, but literally stopping evil Tony’s heart in the process. That alone scares the bejesus out of regular Tony, but when he confronts T’Challa about it afterward, it’s the fact that Black Panther casually admits he’s fine having a back-up plan like that against one of his closest friends that truly surprises Iron Man. Not everyone is a fan of Storm and Black Panther’s marriage, but T’Challa ended it as ruthlessly as he would any fight with a supervillain during the Avengers vs. X-Men event in the bluntest, harshest of ways. Admittedly at the time, T’Challa was going through a hell of a lot, as Wakanda had been through catastrophic destruction at the hands of a Phoenix Force-infused Namor. But while the disastrous aftermath pained T’Challa, what incensed him even more was that Storm chose to stay with the X-Men instead of coming to Wakanda to offer her godlike powers in assistance. So when she does eventually show up to offer aid, T’Challa bluntly refuses it. And then promptly tells her—surrounded by their fellow heroes—that as Chief of the Panther clan, he had already annulled their marriage, and that she is no longer welcome in Wakanda. Later on in the series when the Avengers and X-Men start duking out, as the title implies, he rubs salt in the wound by fighting Storm and revealing he’s always known how to disable her weather-controlling powers, then beats her easily in hand-to-hand combat. Ouch. The 2010 storyline “Doomwar” is a tough one for Black Panther; it’s a moment when he finds himself not just defeated, but overthrown by none other than Doctor Doom himself. Doom doesn’t just covertly take over Wakanda, either, but even offers himself up to the panther god Bast, allowing him access to Wakanda’s vibranium reserves after he humiliatingly steals them from under T’Challa’s nose. Eventually, after infiltrating Latveria in return and almost starting an all-out war, Black Panther eventually confronts Doom in a one-on-one battle. Doom mocks T’Challa for his and Wakanda’s overreliance on vibranium, only for T’Challa to agree... and then send a signal boosted through Doom’s suit that rendered every piece of Wakandan vibranium in the world inert. It robs Doom of his advantage in a moment of total shock, but it also left T’Challa and Wakanda in a suddenly intriguing new state. The year 2010 was a hectic time for Black Panther. Remember when, err, Daredevil became head of the Hand Ninja Clan and then kinda sorta got possessed by a demon and went evil/mad? “Shadowland” was a whole thing that caused not just the street-level heroes of New York to get involved, but a good chunk of Marvel’s mightiest too, including T’Challa. At the end of the storyline Matt Murdock sacrifices himself to defeat the demon within, leaving Hell’s Kitchen without its usual protector for a period. That is, until T’Challa—who at the time wasn’t Wakanda’s king, having passed on the mantle of Black Panther and of the nation’s rule to his sister, Shuri— decides to stick around and become Hell’s Kitchen’s premier superhero. It led to the great series Black Panther: The Most Dangerous Man Alive by David Liss and Jefte Palo, but it’s really just the surprise of T’Challa looking around in the wake of “Shadowland” and basically going “This is my turf now” that’s the fun part. The climactic moments of 2015's Secret Wars see the gathered heroes of (what’s left of) the Marvel universe take the fight to “God Doom,” a wildly powerful Victor Von Doom who forged the Battleworld out of the shattered remnants of the Marvel multiverse in the wake of the universe-mashing “convergence.” Few people can go up against Doom in such a god-like state... and those few include T’Challa. But it’s not just T’Challa as he normally he is. He’s wielding an Infinity Gauntlet from one of the myriad destroyed universes, something that would destroy most people in an instant, or drive them mad. But through sheer force of will, and much to Doom’s surprise, T’Challa doesn’t just have the capacity to use it, but is very happy to use it to beat the hell out of God Doom—at least long enough to distract him from Reed Richard’s plans. If you want another series that highlights what a wildly smart (and thoroughly prepared) Black Panther can look like, the recent Ultimates book from Al Ewing and Kenneth Rocafort is a great choice. Because not only do you get to see Black Panther on a cosmic-level superteam, you get to see him do the nearly impossible: Stand toe-to-toe with the devourer of worlds himself and come out on top. The Ultimates’ first mission sees them attempt to solve “the Galactus problem,” which is to say they want to stop the giant almighty cosmic being who eats planets from continually returning to Earth for a snack. Naturally, the team leaves the bulk of this plan down to T’Challa, so he casually transports himself to Galactus’ realm (an act that, like wielding an Infinity Gauntlet, would drive most people mad) and... just talks to Galactus. Actually, he doesn’t just talk to Galactus, but debates him, running intellectual circles around the world-devourer long enough that the rest of the Ultimates have the time to enact their plan to blast Galactus into the chamber that created him in the first place, turning him into the heroic Life-Bringer instead. Not bad, Black Panther, not bad at all.